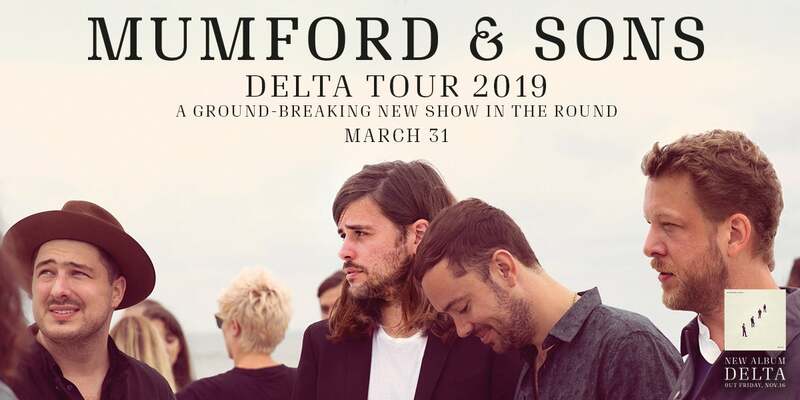 Mumford & Sons will perform at Fiserv Forum on March 31, 2019, as part of their Delta Tour 2018/2019. Presented by Pabst Theater Group, the show will take place at Milwaukee’s new world-class arena. Tickets will go on sale to the general public on Friday, Oct. 12, at 10 a.m., and can be purchased here. Mumford & Sons will embark on an extensive 60-date worldwide arena tour this fall featuring a groundbreaking new in-the-round stage design. The band’s largest tour to date celebrates the multi-Platinum, Grammy Award-winning band’s forthcoming album, Delta. The verified fan pre-sale starts Wednesday, Oct. 10, at 10 a.m. Advanced registration is required by Monday, Oct. 8, at 9 p.m. Available now for pre-sale, the band’s fourth release hits shelves Nov. 16 on Gentlemen of the Road/Glassnote Records. Delta was written collectively by the band, produced by Paul Epworth and recorded at London’s The Church Studios. Listen to the album’s first single, “Guiding Light,” HERE. Marking 10 years since Mumford & Sons made their meteoric debut, the new music follows 2015’s Wilder Mind, which debuted at No. 1 in the U.S., U.K., Australia Canada, Ireland, the Netherlands and Norway and, most recently, 2016’s collaborative Johannesburg mini album. Previous LPs include 2012’s Babel, which was awarded the 2013 Grammy for Album of the Year, and their 2009 debut, Sigh No More.